Visit the Gir National Park, which is the natural home of the Asiatic lion with a healthy population of the other animal species too. This national park in India covers an area of 1150 square kilometers with 300 square kilometers forming the core area of the national park. Gir is located among the low, undulating and excellently irrigated hills in the Junagadh district of Gujarat. Sprawled over some 3,386 sq. 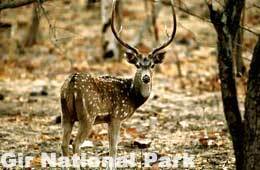 km, the Gir National Park is a mixed deciduous forest with teak, flame of the forest, some Acacia and Banyan trees. Apart from the lion population, the second most commonly found predator in the Gir is Leopard. Infact, Gir national park is also home to one of the largest Leopard populations in any park in India. At one time Gir was a part of the erstwhile state of Junagadh. In 1900, deeply concerned about the future of the lion, the Nawab of Junagadh began to adopt conservation measures to save the harassed king of forests. Till 1948 that is till after Independence more and more lions fell to the guns of so called sportsmen and visiting dignitaries. 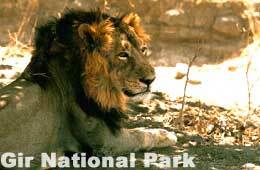 The Gir National Park and Lion Sanctuary was established in 1965, this national Park has a core area of 259 sq. km. with an additional belt of land providing a buffer zone around it. A scheme is underway to relocate some of the lions in a forest block in Barda Hills near Porbandar. going to be axed, as is proposed by the more thoughtful of the governing bodies, and a safari park instead is to replace them with an area of around 1000 acres being set aside with a higher population density of lions to enhance sighting chances. The Gir National Park in India proves to be a protected area for the lions but threats like human settlements, loss of habitat and prey species are obvious. The biggest threat to the lion population is poaching. Though the punishment for poaching is exemplary, poachers do make bids to bag lion skins. Even the nails of a lion are at a premium. It is believed that since a lion himself is brave and majestic, some of those qualities must be inherent in his body parts. Hence the non-perishable nail, mounted in gold and worn as a talisman, chiefly to infuse courage into a timid person. While it is generally believed that the Gir National Park cannot support a lion population in excess of 300, an all out effort is being made to raise the numbers to that magic figure. Generally the census is conducted early in summer when most of the trees in the sanctuary have shed their leaves, enhancing visibility. This makes for greater accuracy in counting. All over the sanctuary, the number of water holes is reduced. The dust on the ground helps forest officials count and distinguish pugmarks. At this time again, the numbers of other animals in the sanctuary are counted and recorded. At Gir there are efficient safety arrangements and to facilitate counting, machans and hides are raised near waterholes. Lions are lured into predetermined zones, using live buffalo calves as bait. Once gathered in the various zones, the lions are fed continuously to prevent them from straying. Getting a head count is a very tricky process but necessary in order to determine the numbers of this rare species. Getting There: Getting to Gir National Park is not much problem due to good connections and roads to and from the reserve. With a Railway and Bus station available at Sasan itself, this mode is preferred if not traveling in your own transport. With the nearest airport, although not too well connected, only 86 km away at Keshod, this is also a decently viable option. Due to a lot of the economic infrastructure of the area based on the tourist inflow to Gir, moving around is not too much of a problem. Sasan is 100kms from Diu, 160 kms from Porbander and 160kms from Rajkot. All three points are connected by air. An ideal connection from Mumbai is - Diu by air, to Sasan by road (2 hours) and to Porbander by road (2 1/2 hours). Keshod is the closest airfield (70 kms) but is currently closed. Train and bus services are also available and Junagadh and Veraval are the usual start points. The roads in Gujarat are average and average driving speed is 50 kms/hour for most parts. 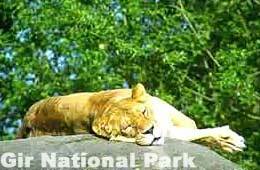 Accommodation: The National Park offers a variety of accommodation facilities located at Sasan near the entrance. You can book an accommodation at the Sinh Sadan Guest House; the rest house run by the Gujarat tourism authorities. Although offering quite the very basic facilities, it offers clean rooms and catering outlets. The rest house is located on the main highway running through Sasan. Jeep rides for internal travel can be booked at the reception area. The Lion Safari Lodge is located slightly off the main highway and offers slightly better but more expensive accommodation facilities. It also offers dorm options for the budget traveler. Climate: The temperatures at the park vary to extremes, as they do with most of the country too. In winters, the temperatures go down to as low as 6 degrees centigrade, while soaring up to a scorching 46 degrees in the summers. The park is open to visitors from November to May but the best time for visiting the park, taking comfort and wildlife viewing into consideration, is December to March. The park offers many excellent drives through scenic areas.